Michael Brown, John Crawford, Reefa Hernandez—and a national youth movement. Last spring, The Nation launched its biweekly student movement dispatch. As part of the StudentNation blog, each dispatch hosts first-person updates on youth organizing. For recent dispatches, check out July 25 and August 12. For an archive of earlier editions, see the New Year’s dispatch. Contact studentmovement@thenation.com with tips. Edited by James Cersonsky (@cersonsky). In the wake of Michael Brown’s death, young people in St. Louis have participated in marches, delivered food and supplies to organizers and residents, conducted trainings—and acts—of civil disobedience and pushed demands in coordination with the Hands Up, Don’t Shoot Coalition. The Justice League, a collaboration of Show Me 15, the St. Louis fast food worker union, and Young Activists United St. Louis, which organizes students and youth, is led by people of color with the goal of combating and redressing police violence. As we prepare for Saturday’s appreciation day, whose goal is to elevate the leadership of youth in Ferguson, we are working on curriculum materials with an emphasis on individual rights and the historical threads that made Ferguson happen. It is painful to watch someone who so closely resembles your brother, uncle or father lay in a pool of his own blood after departing this world. The black community, especially those of our generation, is in a state of trauma. On August 25, the day of Michael Brown’s funeral, students at Washington University at St. Louis and Saint Louis University organized #HandsUpWalkOut events on our campuses as part of a national walkout. We will continue to work as a united front for justice for Michael Brown and all those taken by forces who don’t believe in the humanity of those who happen to be black. 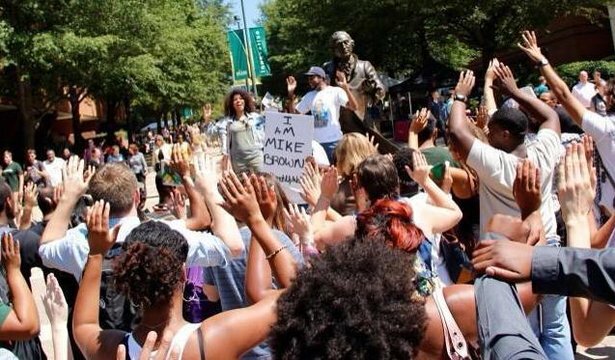 On August 25, students and faculty at George Mason University, convened by a range of organizations, from the Black Student Alliance to Students Against Israeli Apartheid, came together to protest the murder of Michael Brown. The protest began at North Plaza with a march to the George Mason statue with everyone’s hands up, chanting, “Hands up, don’t shoot!” We continued with a moment of silence followed by a reading of names of others taken too soon by police brutality, including Timothy Stansbury, Oscar Grant and Eric Garner. From there, we broke into smaller groups to develop proposals for how the campus community can help rebuild Ferguson, hold police officers more accountable and help limit and eventually eliminate police brutality. On August 14, five days after the murder of Michael Brown, Dream Defenders went to US Attorney’s Office for the Southern District of Florida to demand a federal investigation into the murder of Israel “Reefa” Hernandez. Israel was a Miami Beach teen and street artist who was chased down, brutally beaten and tasered by police for painting on an abandoned McDonald’s. More than a year later, the officer has not been charged. We called for US Attorney Ferrer to open investigations into State Attorney Katherine Fernandez Rundle’s Office, as well as the Miami Beach, Miami-Dade and Miami Garden Police Departments. Instead of having grievances heard, seven Dream Defenders and a mother from the Miami Workers Center were arrested and released later that evening. As we can’t count on police departments to adequately protect and serve us—or conduct proper investigations when the suspect is one of their own—we are issuing a national call to action. On August 5, 22-year-old John Crawford was killed by Beavercreek police inside a Walmart after brandishing a toy rifle, which was sold in the store. Since then, young people across Ohio have taken action to demand that Walmart’s security tapes be released to his family, their lawyers and the public. Within twenty-four hours of the Ohio Student Association’s third action in Columbus, the Ohio Attorney General allowed the family and their lawyers to see six minutes of the footage—prompting his father to say that his son was murdered. The AG has called a grand jury hearing in Greene County to determine if these officers will be indicted. On September 22, we are organizing a pilgrimage from the Beavercreek Walmart to the Xenia Courthouse to bring national attention to Greene County and demand justice for John Crawford. On August 26, 100 young Chicagoans marched on Chicago Police Department Headquarters demanding to meet with Superintendent Garry McCarthy to end the unjust arrests of Black people for low-level marijuana possession. As of today, McCarthy has not responded to our request, despite publicly stating that the CPD should focus on ticketing instead of arrests. The Chicago Police Department makes an average of forty-four arrests per day for misdemeanor marijuana possession (fifteen grams or less)—more than all other offenses combined. Despite extensive studies showing that marijuana is used at similar rates across racial groups, Black people are fifteen times more likely to be arrested for minor possession than white folks. Black Chicagoans account for 78 percent of those arrested, 89 percent of those convicted and 92 percent of those jailed for low-level marijuana possession. The Chicago Department wastes nearly $80 million in local taxpayer dollars each year in court fees and thousands of police hours. This work is part of BYP100’s larger campaign to decriminalize blackness in America and end police brutality and abuse. On August 19, LA’s Community Rights Campaign won a huge victory by passing the Equal Protection Plan. The plan will restrict the role of police inside LAUSD and provide more serious protection for students, teachers and the community. For seven years, young people have taken direct action and organized around the plan in front of schools administrators, judges, school board members, police and teachers—and taken it to the surrounding community to seek its support. With its passing—fifty years after the original Freedom Summer in Mississippi, where I attended an anniversary conference at Tougaloo College—we see this as our moment to build the world we want and step closer to dismantling the school-to-jail track in Los Angeles and across the country. On August 18, more than 100 members of the Chicago Students Union, alongside parents, teachers and elected officials, marched on Chicago Public Schools headquarters demanding the fair funding of schools and a democratically elected board of education. The CSU, formed in February 2013, has spent this summer holding meetings to listen to the problems students are having at school. In the upcoming school year, the CSU will register eligible students to vote, push CPS officials to ensure that students’ needs are prioritized in school budgets and escalate the fight for funding and democracy. 9. What Wouldn’t Marco Rubio Do? On August 25, members of United We Dream, United We Dream–Tampa Bay, El Cambio and the Dream Organizing Network came to South Carolina to confront Florida Senator Marco Rubio on his attacks on the Deferred Action for Childhood Arrivals policy, a program that has benefited more than half a million Dreamers like myself. Instead of standing with Dreamers, Rubio has turned his back on our community and sided with anti-immigrant Congresspeople like Steve King. As a Florida Dreamer, I had one question for Rubio: Does he want to deport me? Dreamers remain committed to fighting for DACA, turning back Republican opposition at every corner and winning similar relief for millions more. From August 11 to 14, thirty new members of the AFL-CIO’s Young Worker Advisory Council had a biannual meeting to discuss how the labor movement can empower young workers and better advocate for the largest generation to enter the workforce since the Baby Boomers. The YWAC, created in 2011, consists of young worker representatives from affiliates of the AFL-CIO. YWAC members are working on two major projects: growing local Young Worker Groups that can build community-based campaigns in targeted areas; and preparing for a 2015 Next Up Young Worker Summit that will engage, inspire and organize young workers. Through these projects, we hope to build a movement around our issues, including student debt, sub-living wages and—as the world’s eyes converged on Ferguson as we met—racial justice.